America still stands as a beacon of liberty because we have been willing to fight and die for freedom, both here and abroad. Yet the nation that began as a haven for those fleeing religious persecution is now faced with a vocal minority expressing opposition to honoring our fallen with a Christian cross. A century ago nearly 117,000 Americans perished in World War I. Some of those heroes hailed from Maryland’s Prince George’s County. Fearful that their loss would be forgotten, a group of area Gold Star moms banded together to commemorate their sacrifice. They chose a popular battlefield headstone, under which U.S. military personnel are buried overseas, as the model for the Bladensburg World War I veterans’ memorial. Citizens donated space to honor their local heroes. Sympathetic veterans and politicians ensured that the monument was built. The American Legion, represented by First Liberty, is currently defending the monument in court, because it was the American Legion that turned the moms’ vision into reality, dedicating the 40-foot structure in 1925. Most people know it as the Bladensburg (or Peace) Cross, and today, as a result of an eminent domain taking, it sits on public park land. The cross is a reminder of the tragic truth that freedom isn’t free. What possible objection could there be to such a memorial? Simple. It contains a cross. And it sits on government land. No one complained about the memorial for nearly 100 years until a so-called “humanist” group filed suit, contending that it advances religion, has no secular purpose, and entangles the government with religion. Thus, the group contends, the monument is forbidden by the First Amendment and must be torn down. If anyone doubts the importance of President Donald Trump’s appointments to the federal judiciary, they would do well to remember this case. The second highest court in the land says that a century-old monument honoring America’s war dead must be torn down because a constitutional provision renowned for protecting religious liberty bans the use of the same cross that adorns most American graves in foreign military cemeteries. If the ruling stands, what comes next? What other monuments across the U.S. will topple on a judge’s order? Must gravestones at Arlington National Cemetery be removed? Do its crosses also impermissibly “establish” religion? The memorial is on the National Register of Historic Places, but it is not just a historical artifact. It represents the indomitable spirit that always has animated our people and nation. 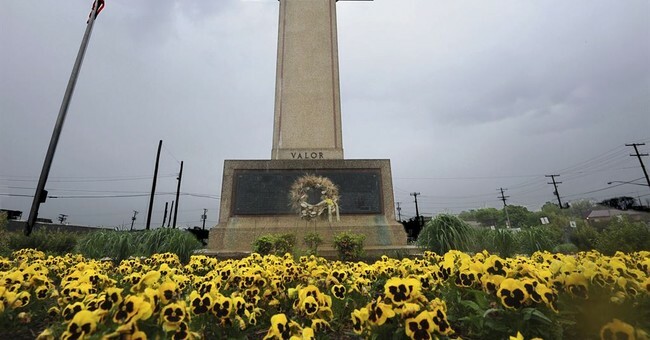 Army veteran Brett Reistad, the American Legion’s national commander, has observed that the Bladensburg Cross “is more than concrete and bronze. It is the fixed symbol of 49 men who gave everything to preserve our freedom.” Too bad some jurists find it so hard to understand this point. There is hope, however. Last November, the Supreme Court agreed to hear this case on February 27, 2019 with a decision expected in June. The case offers the Court the chance to take a more balanced, constitutionally grounded approach to rendering its final decision on this precious national landmark. This monument was built when Americans felt free to celebrate the core spiritual beliefs that motivated them to undertake extraordinary deeds. But today, we are less free because the left has launched a war not only on God, but on those of us who believe in Him. The attack on the Bladensburg Cross is just the latest battle in a larger conflict. Defending the memorial does more than sustain the memory of 49 brave Americans. Doing so protects the First Amendment’s freedom of religious expression for all of us.